Data show that regions in the state with the highest percentage of people with insurance made possible through the Affordable Care Act — better known as Obamacare — are in rural areas that also have the highest rates of death from medical conditions among people under 65. A repeal of Obamacare would hit Washington hard — but nowhere harder than in parts of the state where people are the sickest. The Affordable Care Act (ACA) — better known as Obamacare — vastly expanded Medicaid enrollment by extending eligibility to low-income people under age 65. Washington is one of 31 states, plus the District of Columbia, that had adopted the Medicaid expansion. Here in Washington, data show that regions with the highest percentage of people under 65 with insurance made possible by ACA are in rural areas where people are more likely to die from disease at a relatively young age. The Legislature has divided Washington into 10 regions for the administration of health services. Of these, two regions have a significantly higher concentration of people insured through Obamacare: Timberlands and Spokane. The highest percentage of people newly insured because of the ACA is in the Timberlands region, which is made up of five counties in the southwest corner of Washington: Grays Harbor, Pacific, Lewis, Cowlitz and Wahkiakum. As of November, 2016, 18 percent of the population under 65 — more than 38,000 people — have gained coverage either through the Medicaid expansion enabled by the law, or by the state’s health exchange. That’s a good thing, because this also happens to be the sickest area in the state. In 2015, the most recent year for which data is available, people under 65 in this region died from disease at the highest rate in Washington: 217 per 100,000 population, after adjusting for age. That’s about double King County’s rate. 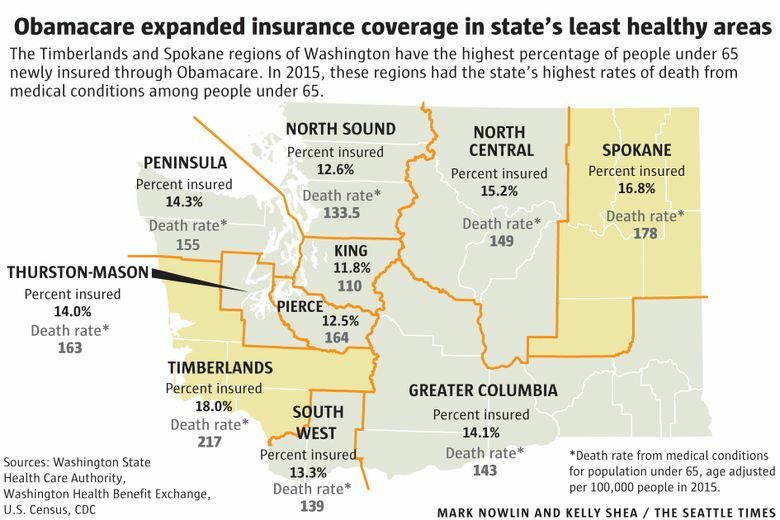 The Spokane region, which includes six counties in Northeast Washington, has the second highest rate of coverage from Obama­care. Here, 16.9 percent of the population under 65 — more than 84,000 people — have recently enrolled. This region also ranks second for the rate of people who are seriously ill at a relatively young age. In 2015, the age-adjusted rate of death from disease among people under 65 was 178 per 100,000 in this region. Both the Timberlands and Spokane regions are largely rural. I recently wrote about the declining health outcomes in such areas of the state — a trend not in evidence in urban areas like King County. There are a variety of reasons for this disparity, including that people in rural areas are less likely to have health insurance. But Obamacare is changing that. And with so many fewer uninsured people in rural areas, health outcomes there could improve dramatically. At this point, it’s too soon to measure that impact, according to Daniel Lessler, chief medical officer at Washington State Health Care Authority, which administers the state’s Medi­caid program. But Lessler says we do know what happens over time when formerly uninsured people get coverage through Medicaid. While there is a higher rate of enrollment in rural areas, heavily populated King County has the greatest number of people insured through the law — more than 205,000. And statewide, by the end of last year, more than 770,000 people were receiving insurance because of Obamacare. Most of these — more than 600,000 — receive health coverage through the expansion of Medicaid. As of September, an additional 166,000 people were covered through the state’s insurance marketplace, run by Washington Health Benefit Exchange, which was launched in October, 2013. Lessler says it’s hard to gauge, at this point, what the impact of an Obamacare repeal would be in Washington. But if Obamacare is fully repealed without an adequate replacement? Information in this article, originally published Feb. 24, 2017, was corrected Feb. 27, 2017. A previous version of this story gave an incorrect first name for Daniel Lessler, chief medical officer at Washington State Health Care Authority.